Congratulations to all of the 9th and 10th grade students who applied to and were accepted into the Riordan Scholars SBI program. Email notification was sent out today, so you should check your email to see if you have received one. There were a few instances where we did not receive a student email, so students should check in with their parents as we sent the notice to the parent email listed in PowerSchool. As a reminder, please let us know that you do accept your offer, because there are other students who may be on a wait list and would like to participate. We fully expect that students will attend all sessions in order to get the most out of what the mentors have to offer. The first meeting will be this upcoming Saturday—November 5th from 9am-11am and will be a ‘Meet and Greet’ with the mentors. Parents are invited to attend for the first 15 minutes if they would like the opportunity to meet the mentors as well. All other meetings during the months of January – April will be held from 9am-1pm. They will be held in a classroom and we will let the students know where that will be by posting here and notifying them via email. Congratulations! You are on the beginning of your College Knowledge journey! Week 12 Update – Spirit Week! Designers, Week 12 is Spirit Week! Check out the themes for each day below in the update. On Halloween, students are welcome to wear costumes but they must be appropriate (in both content and coverage), and no masks or weapon-like objects are allowed on campus. Same goes for any Spirit Week themed day. Eligible students can donate blood at the Blood Drive on Wednesday 11/2. Don’t miss the Staff vs. Student Football game on Thursday 11/3 – it is sure to be an entertaining one! It will take place at 4:30 pm on the back field. 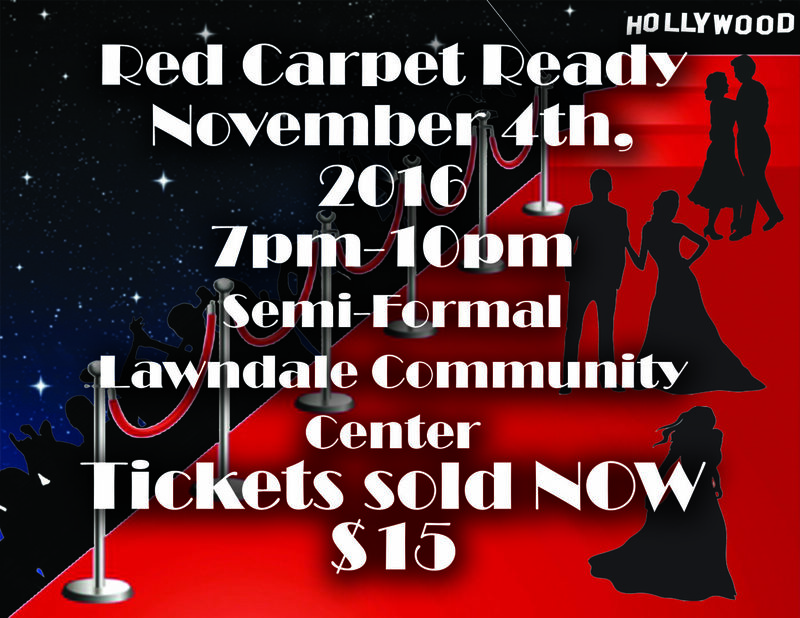 Lastly, remember to purchase your tickets ($15) for the Fall Semi-Formal Dance this week! 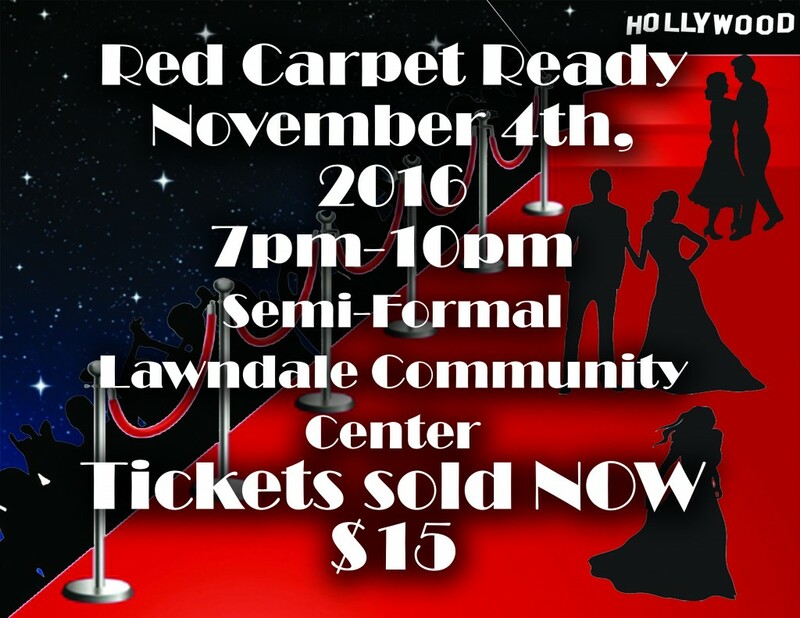 The theme this fall is “Red Carpet Ready” and it will be held at the Lawndale Community Center from 7:00-10:00 pm. For those students interested in applying to the UCLA Riordan SBI program, applications are due tomorrow–October 27, 2016. Attached is the information sheet and application. We will select 25 students to participate. Students must be in 9th or 10th grade to participate in the program. Are you a student who is talented in the arts and want to expand your skills? Are you looking for a great way to build your skills and an arts portfolio for arts colleges? The Ryman Arts Program is accepting applications for the Spring semester and if you are accepted, the program is FREE! Come to an information session on 10/27/16 in Ms. Gavagan’s room (Room 204) during lunch. How: Application, recommendation, art submission. The deadline to apply for the 2017 Spring semester is December 2, 2016. Come to the information session to learn more! On Tuesday, October 25 during lunch time, a representative from the UCLA Riordan Saturday Business Institute will be on our campus to provide a presentation on this fantastic and FREE college and career readiness program. This Lunch and Learn presentation will be held in Ms. Garcia’s classroom during your lunch hour. This is the fourth year that this program will be held on our campus and it provides a unique opportunity for freshman and sophomore students to learn about college search, college costs and financial aid and scholarships and career pathways. The mentors/instructors for the program are members of the Riordan MBA Fellows program at the Anderson School of Management at UCLA. The program will begin in November and there will be four additional meetings starting in January and culminating in April with a visit to UCLA. Participation in this program also provides an added advantage when applying to the Riordan Scholars Program in May of 2017 which is held during the school year once per month on Saturdays on the UCLA campus. Please come to the Lunch and Learn information session to learn more and to pick up an application. A flyer is attached with additional information. Designers, we have two announcements for you on this gloomy October Monday! Starting tomorrow, Tuesday 10/25, there will be a Study Hall/quiet space on campus before school available to all students DAILY if they would like a safe, quiet space on non-office hours days, or in place of office hours. On Mondays & Wednesdays it will be held in Ms. Wynn’s room (202) and on Tuesdays, Thursdays, and Fridays it will be held in Korey’s room (105). Monday-Thursday it will run from 8:00-8:50 am and on Fridays it will run from 8:00-9:50 am. Please contact us with any further questions. 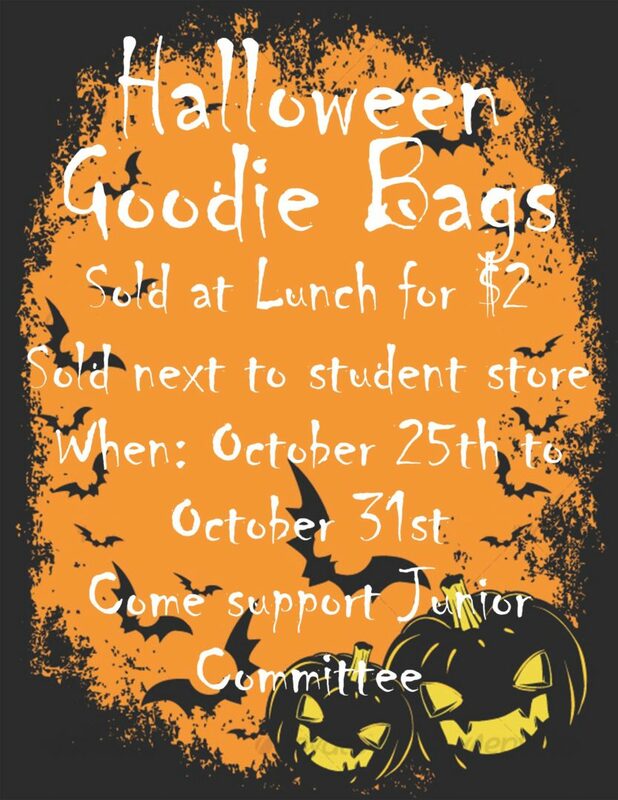 Junior Committee is selling Halloween Grams this week, Mon-Fri! See flyer below for more details. They will be distributed after lunch on Monday 10/31. 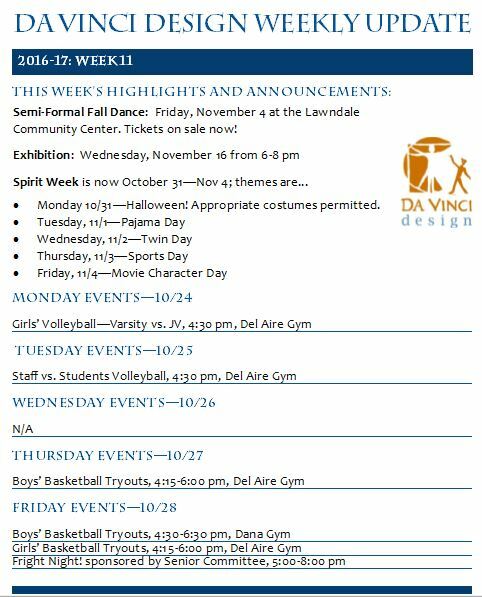 Designers, check out this week’s update for upcoming fall events like Fright Night, Spirit Week, and the Fall Semi-Formal dance! Winter sports’ tryouts are also starting this week. Have a wonderful weekend. Watts Counseling Center, in addition to, other services provided for families. The spring SAT and ACT prep courses are facilitated by the Princeton Review. These programs will fill-up fast! Contact Tenesha G. Scott, M.A. Educational Counseling Education and Outreach Programs Coordinator at tenesha.g.scott@kp.org with any questions you may have! Tickets are now on sale during lunch in the student store! Attention DVD students: there is a need for reliable high school volunteers for Dana Middle School’s yearly Spooktacular on Friday, October 28th from 4:00 PM to 8:20 PM.